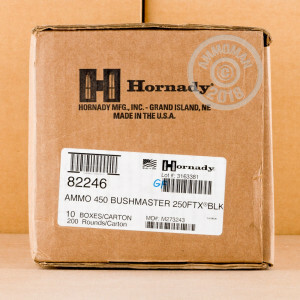 Hornady’s BLACK line of ammunition is optimized to deliver perfect results no matter the firearm you chamber it in. 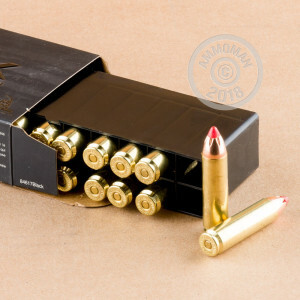 If you’ve a powerful 450 Bushmaster AR-15, then you’ll find a lot to value in this round’s first rate brass casing, non-corrosive and sensitive primer, and propellant that guarantees consistent chamber pressure. It’s also an excellent choice for your lever action rifle, as its bullet’s soft polymer tip will make the chances of magazine ignition moot. 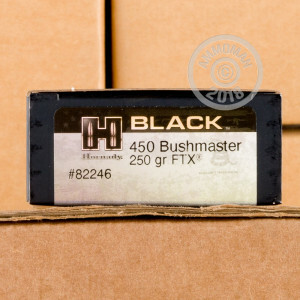 This round’s 250 grain FTX profile is exceptionally accurate thanks both to its secant ogive profile and its streamlined polymer tip. That tip serves yet another purpose, too, by initiating rapid expansion as it wedges deeply within the core upon impact. This bullet’s heavy jacket and high antimony lead core are bound together mechanically by their InterLock ring, and accordingly deliver superior weight retention during penetration. This round could only be better equipped for buck hunting if it stuffed and mounted your trophy for you as well.